Off the Hook Astronomy: Happy birthday, Savta! Two days ago, on April 11th, my maternal grandmother (who I call Savta) turned 90 years old. She still has her marbles (for the most part), her mobility, and her teeth, a fact which she is very proud of. She's been living in a retirement home for about seven months now, mostly because she's almost entirely blind, and has become very forgetful. She knows that she has these problems, which is why I said she still has her marbles, but it's better that she be living in a retirement home than alone in her house. At any rate, she seems to be doing very well for someone her age. For her birthday, my mother organized a party at the residence, and besides my parents, who drove all the way from Sherbrooke, QC, a whole bunch of her relatives showed up, many of whom I had never met. There was lots of food and a lovely cake, and I think Savta enjoyed herself a lot. 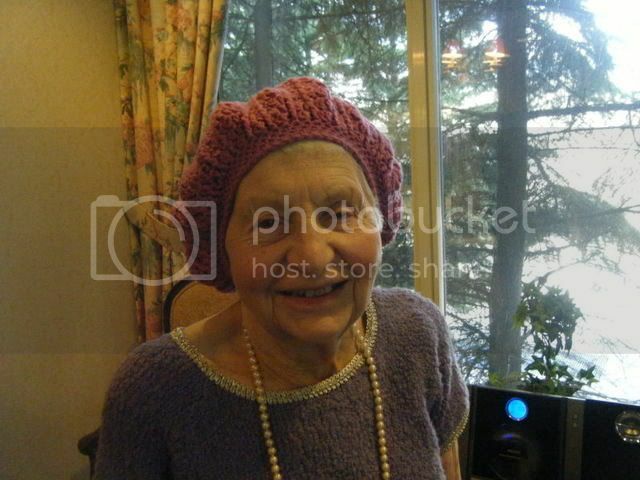 My birthday present to her was a crocheted beret, which I made with some of that leftover pink yarn. I had shown her my Kitty hat, and she loved the colour (which looks much nicer in real life than in the picture). I have a feeling that she'll loose it soon and forget about it, but she seemed so happy when I gave it to her, so I guess it's worth it. The dress she's wearing, she knit herself. She has knit countless sweaters, afghans, pillows, hats, and scarves, and only quit recently because she couldn't see well enough. She wasn't much for crochet, but her mother apparently would crochet these lovely lace doilies and couch covers (you know, the things that cover the arms and backs of couches), and I believe it's my great-grandmother's crochet hooks that I inherited. I feel like needle-crafts connect me to my female ancestors, especially since my mother also knits. It's like these crafts are something which transcend generations, and maybe this is one of the reasons why I enjoy knitting and crocheting so much.